This page shares some of my photos, linked to my flickr photo gallery. I am also giving some comments on the photos, either technical or regarding choices I made or situations I was in when I did the photo. You are welcome to give an appreciation of these photos, and thus help me improve. Voici un module Flickr utilisant des photos et des vidéos publiques de othmane.bekkari. Créez votre module ici. This may not be my best shot from a technical point of view, but it will probably my preferred one for long, for its symbolic value. 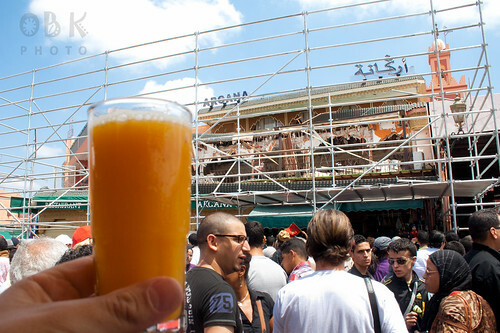 After the terrorist attack that happened in Cafe Argana in Marrakech on April 28, there was a call on facebook for a gathering exactly ten days later on the famous Jemaa El Fna place, with the symbol of the orange juice as the flagship of the place. I was of course there with all my gear, and I probably hit my shutter more than 100 times. There was a mixture of feelings in this crowd: anger, hope,solidarity, ... I got a lot of beautiful pictures, with Moroccan flags, with banners, ... But I really like this one because it conveys a real message: the simplest things in life can beat the most horrible ones. This is a shot that I took during a business trip to Paris. I managed to keep a couple of hours to take some photos. I went to the Chaillot palace which is a magnificent place with a direct view to the Eiffel tower. I wanted to do something different from the usual tourist shot. So I spotted a statue and planned my shot. I framed my shot through a space between the arm and the body of the statue. I had to get vey close to the statue, as the opening was pretty small. I had to try several shots to get the right exposure on the statue. On the first shot, the statue part was completely black. So I had to use the flash to brighten it a bit. However, I was so close that it got completely burnt out, even by going manual flash and setting it to the minimum power. To get the final shot, I covered the flash head with a tissue. 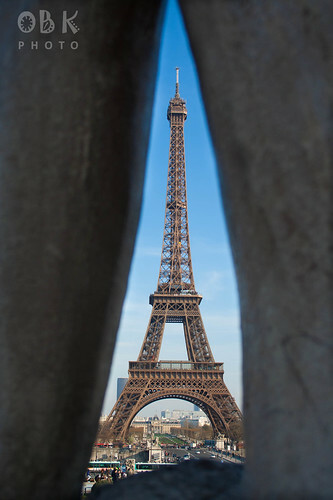 I like this shot because the shape of the opening is very close to that of the tower. It looks like the tower has been emprisonned between these pieces of stone. This is my first photograph to reach 80 views on flickr. It also got 8 comments, by the way. This is not a huge score by flickr standards, but to me it is a good start, and an encouragement to go further. What I like about this photo, on top of the colors, is the dark-bright-dark-bright vertical scheme. One of the comments on Flickr suggested that I could also have a nice result by including only the trunks of the trees. I will try that on another occasion. Technically, this photo was taken with my Canon EOS 350D set on a tripod with my 18-50mm lens set to 24mm. Aperture was 18 to allow for a good Depth Of Field, and I set the shutter speed so as to get the right exposure on the background sky, which happened to be 3.2". 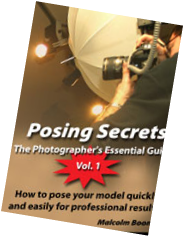 In reality, the nice thing about digital photography is that you can shoot several photos and then choose the one that you want, which encourages you to move from the automatic modes to manual mode. The photo was then worked out a bit on lightroom (photo editing software by Adobe), mainly to darken any parts of the silhouette which would not be really black. 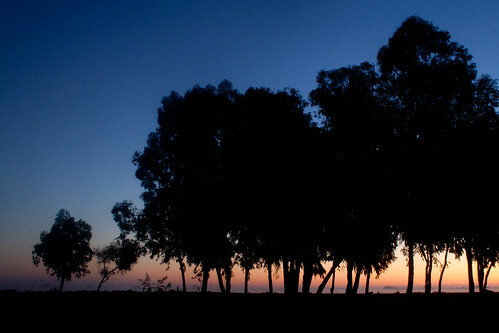 This photo was taken in the early morning of Jan 11 near the Casablanca (Morocco) airport, and was posted on Flickr that same day. This is the latest photo I posted in Flickr. My intent that morning was to take some photographs of the Casablanca HassanII mosque, as well as the Casablanca lighthouse. However, the cloudy sky did not allow for the kind of photos I wanted. I was walking on the rocks by the beach to find a good point of view, when I realized that I had a great subject just right under my feet. This is the first time that I take photographs of a subject that is underwater, and I was not quite sure about how the light would behave. I set the camera on a tripod in an almost vertical position (slightly angled to avoid camera reflection on the water) and used the flash off camera, handheld. I tried different flash positions until I got the right lighting. A little work in post-prod to make the corners darker, giving the photo an impression of depth. 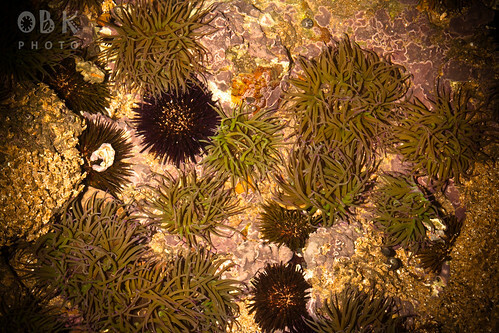 Urchins and anemones are part of my childhood. We used to spend our summer on a rocky beach, and we spent our days swimming, walking and running barefoot on the rocks. Every other day, we had a couple of urchin darts get into our feet, which my grandmother had her own method for removing.